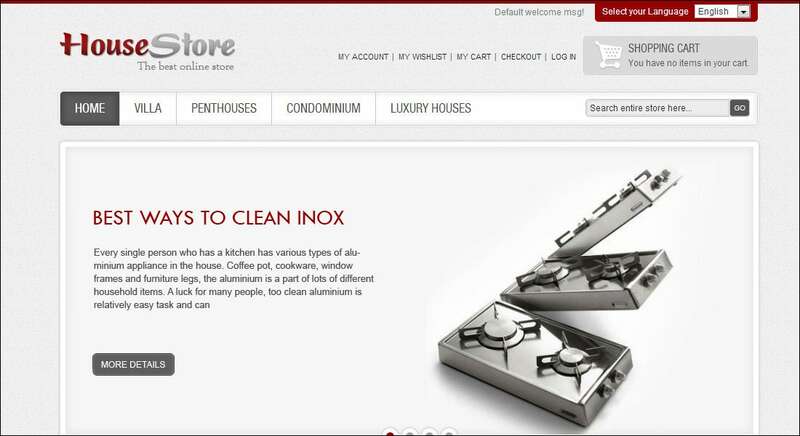 Designed for online gadgets shop, Home Electronics is also adaptable to market related electronic items also. This clean design with quick and easy navigational tools along with its well-arranged content could guide the customers to the right product. 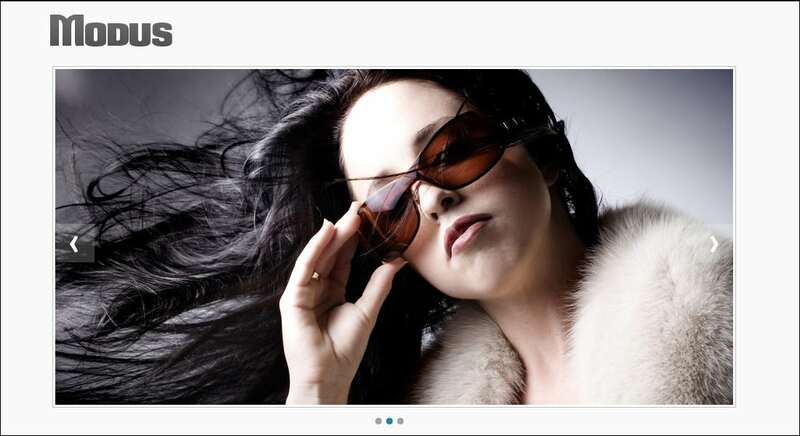 This responsive design also has cloud image zoom option, custom page templates and social options. 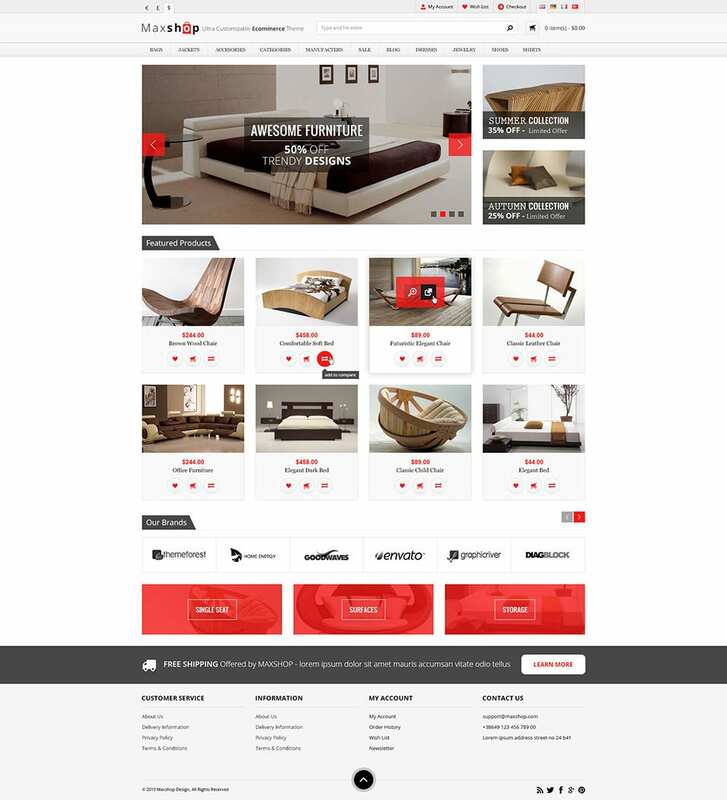 This table free theme comes with a slide show of desired banner images across the whole width of the screen along with a slider that notifies the list of all the brands just above the footer of the page. Options like the product tabs on the header, cloud zoom images, editable image size before publishing and much more are provided. This comes with tabs of the major categories in the main menu and a huge banner slide on the home page. All the featured products are showcased below the banner. 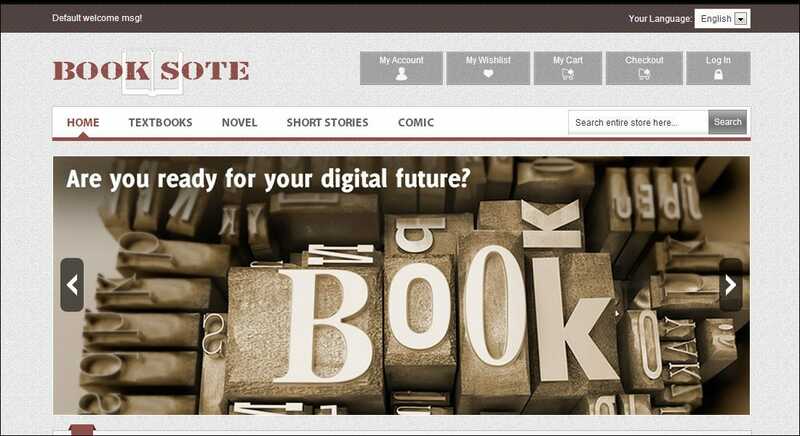 A brand slider is displayed just above the footer to showcase all the major publishing brands available. 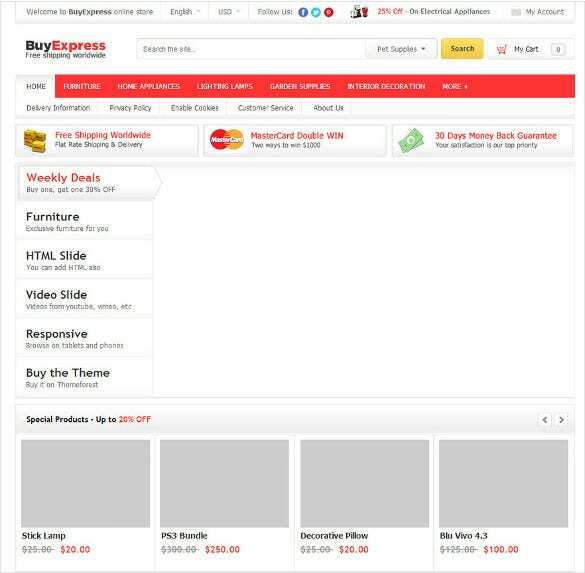 Besides, a hidden drop down shopping cart appears to the right margin of the page. social media integration buttons are provided to stay connected with the fans. 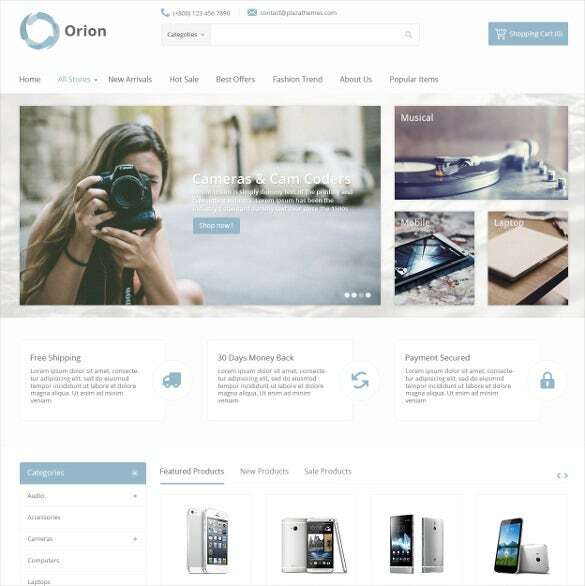 While the featured images appear just below the categories tab, offers are showcased below that and the new products in a manually operated slide appear on the home page. The footer in a complete grey shade is for social integration, service and support details, information and contact options. This is made from a table less design and has a cross browser compatability. 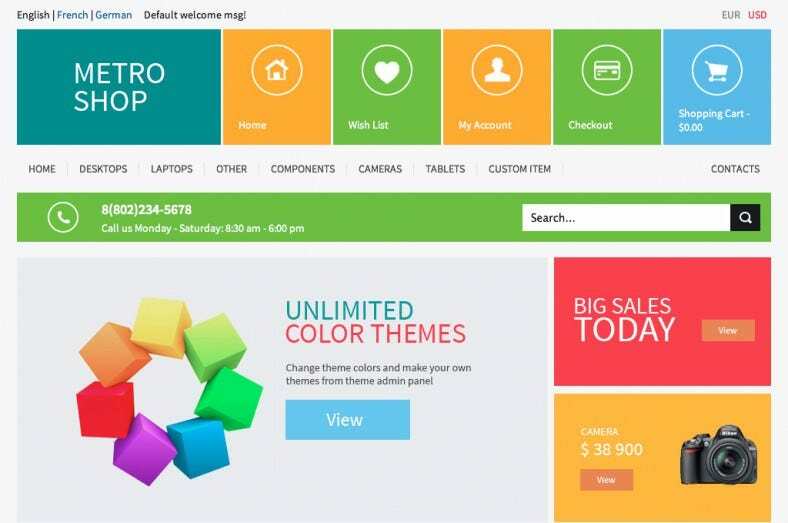 This theme comes with a complete changeable color options and backgrounds. This has got all the means to grab the attention of the visitors like an amazing slide show of featured products, followed by movable offer products, and then the products in a selected category and section. The best sellers proiducts tab on the left margin is the highlight . 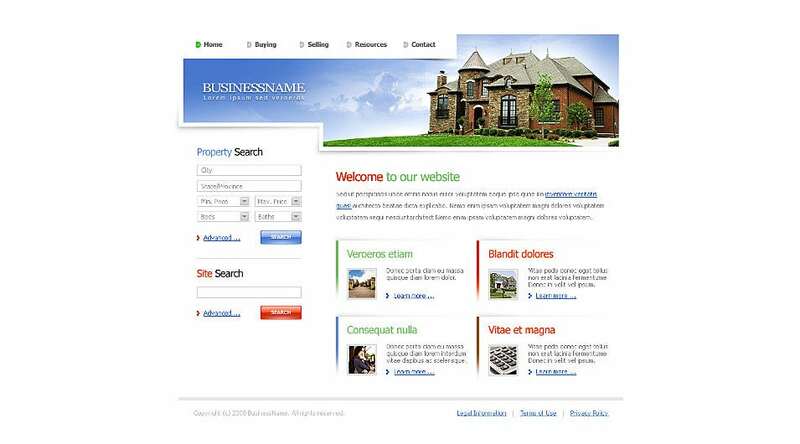 This is easily customizable and new products are always displayed on the home page. 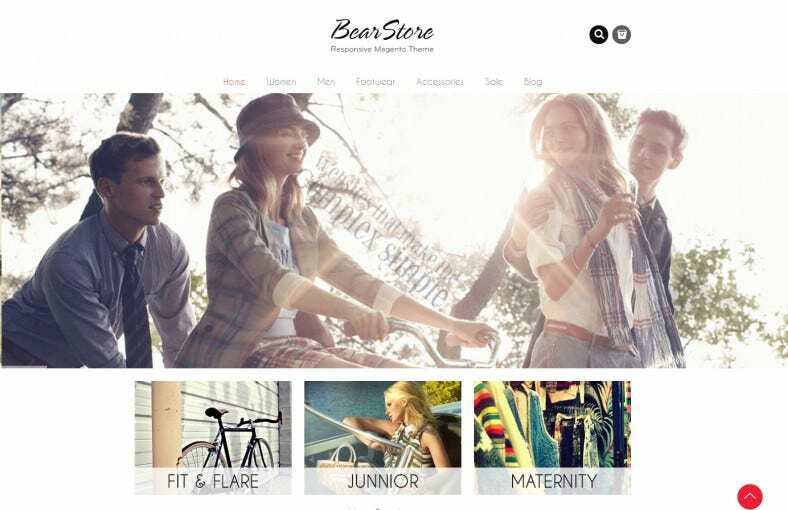 MT Gero theme is ideally made to suit the purpose of an e shop for fashionable apparel and designer wear. 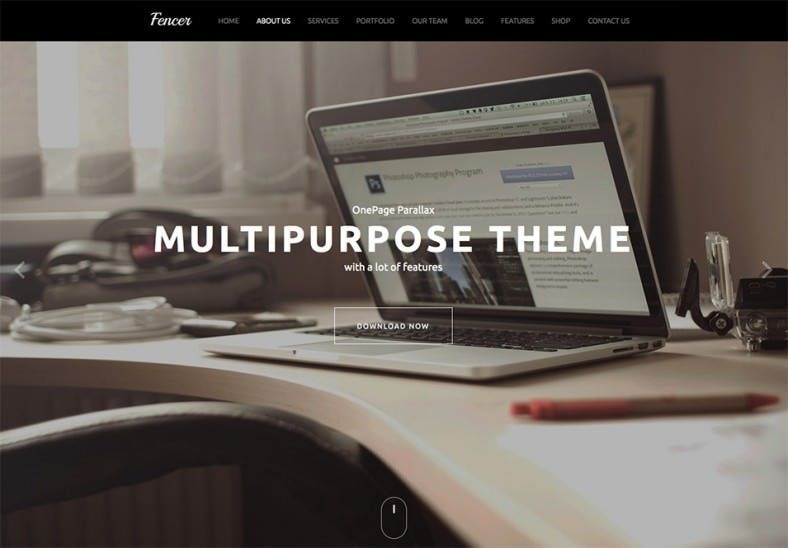 This theme features mega menus and smart menus, cloud zoom, integrated google fonts, touch slide options for iOS, Ajax based add to cart, cool social media buttons at the bottom of the page and much more. Coded completely based on the HTML 5 and CS3, the menus from the tabs are quite big to expand besides being large. The image sliding option too is quite attractive and about 33 predefined color schemes are available. 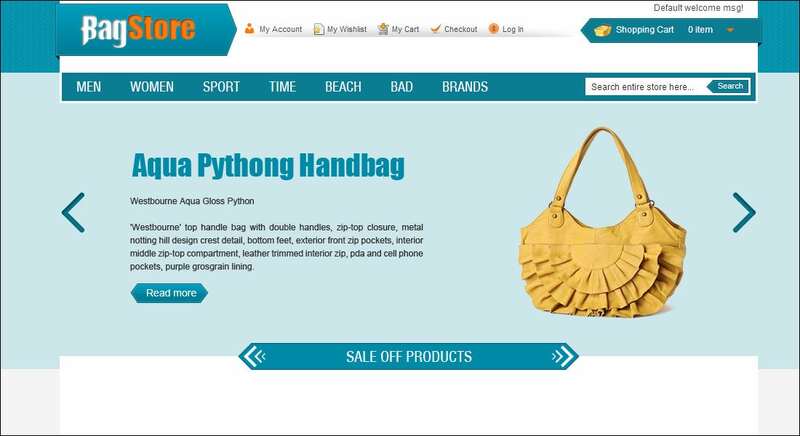 Options such as UI widgets, customizable product page and layouts are the advantages. This is yet an another minimal design theme released in 2013. 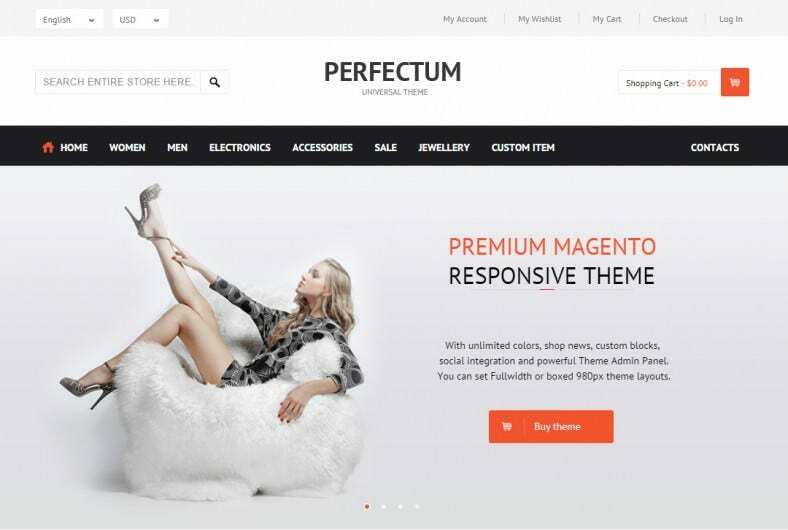 The elegance that the theme creates suits the purpose of the high end fashion store. 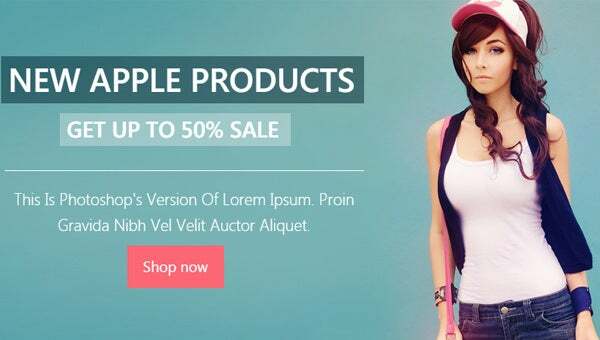 This has features like the product slider with effects, a comprehensive mega menu and a spot light effect that a powerful e shop is expected to deliver. 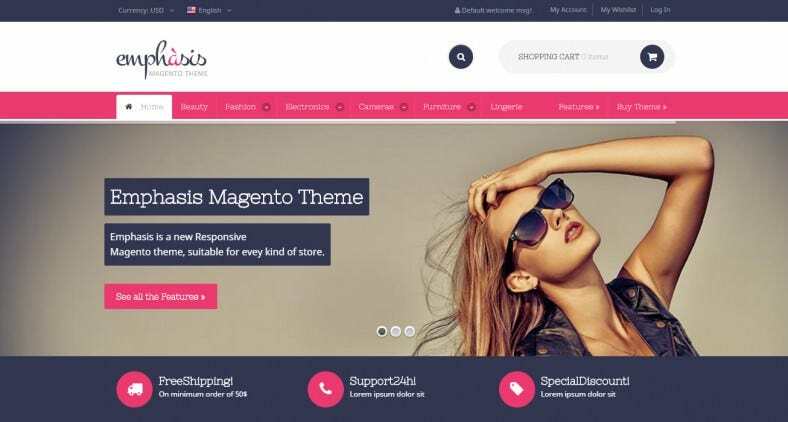 This is a great option for those in pursuit of a funky and trendy e-commerce theme. The interactive price tag effects, besides the hook style menu give it a cool look. The list of latest products in a medium size display images with price, description and rating makes it an option to be considered. This simple fresh theme with a minimal design is quite interactive with a product image zoom function upon hovering, full width slide show on the home page and menus with multiple hidden submenus. Social media links are at the bottom of the page in plain text while the twitter follow button is exclusively provided on the right margin. 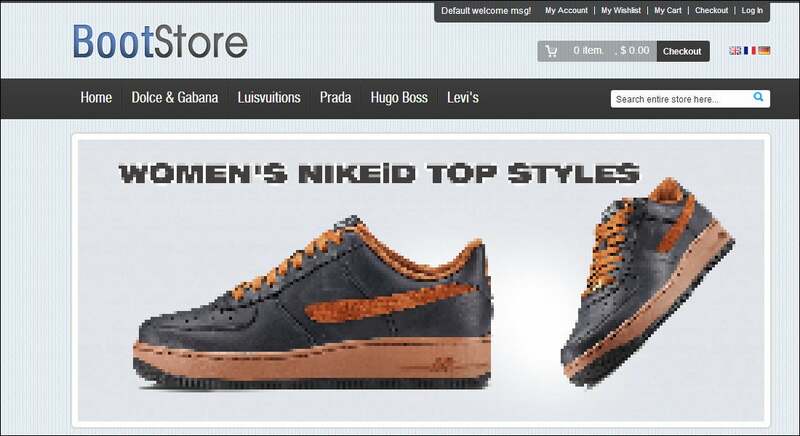 The cart and compare products are available with a drag and drop features on the right margin.